It is OK to dream. To dream, for instance, like one reader, who suggested the best trail in Humboldt County is "anywhere in the Alps." Indeed we are not, in fact, obliged to remain in our coastal mountain landscape but can, in the blink of a swoony eye, drift ourselves into a wonderland where all trails lead to waterfalls, glaciers, lakes, quaint villages, ibex bounding along rocky slopes and funiculars that whisk you back to your B&B. 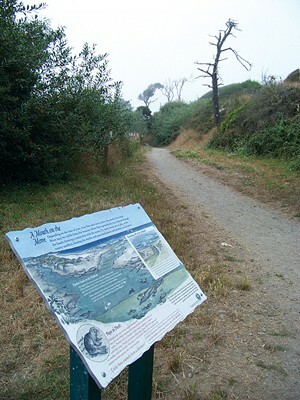 It is also OK to dream more practically -- nothing wrong with it -- that the best trail in Humboldt is, in fact, as another reader noted pointedly, "the one that doesn't go between Arcata and Eureka." But once we recover from these vapors, we have a fairly decent runner-up: the Hammond Trail. No, it's not decent. It's magnificent -- as long as you hit the Hiller Park section on a day when the wind is not wafting trailward from the wastewater ponds. The Hammond Trail's wonders include paved and dirt stretches, hills and flats, canopy tunnels and wide-open ocean vistas. You can be rolling on your bicycle past a ball game at the park one moment and, the next, peering between foliage at a pod of sea lions lolling alongside the mouth of the Mad River while seals cavort in the riffling waters. There's even a pedestrians-only section, which ventures into the green, viney maw of the Widow White Creek drainage. There is no tram. Deal with it. The Breakdown: Hammond Trail 20.8%, Fern Canyon 8.5%, Headwaters Forest 6.7%, Arcata Forest 4%, Trinidad Head 3.5%. Category popularity: 28th.